Growing up, church was about as enjoyable as being thrown naked into a tub of red ants. The only time I enjoyed church was when we heard someone pass gas during the silent prayers. Or when I was hungry and got to eat that wafer thing. From high school on, I went to church only when necessary (weddings, funerals, exorcisms, etc.) and thought that anyone who believed what was being preached at church must have a few screws loose somewhere. It wasn’t until about 25 years later that I would start to reevaluate my position. My spiritual/intellectual journey began as a result of a lifetime of unanswered questions combined with a moment of reflection — I realized that many of my good friends, family members, and associates were Christian. These are intelligent and rational individuals, so how in the world, I asked myself, can they seriously believe in all the ancient myths, superstition, and supernatural events associated with the religion? Can Christianity be true? After all, I really never devoted much time to it and I never really read the Bible. Even if it were not true, who am I to take away a worldview that is apparently working for so many people? And the most important question, are better off without Christianity? These are questions I had to seriously consider before “going public” with my views. I devoted countless hours to studying religion — Christianity in particular, which included reading the entire Bible cover to cover (New International Version). I have listened to over 1000 hours of religious debate, read many books written by both atheists and Christians, and completed dozen of courses from world’s leading universities on Christianity, Catholicism, Theology, Biblical Studies, Argumentation, Historical Jesus, Cosmology, Neuroscience, Human behavior, Biology, Classic, Quantum, and Particle Physics, Philosophy of Religion, and even Apologetics. While I am far from an expert in all these fields of study, my area of expertise is in the arguments for and against the existence of God as well as the arguments for and against the truth of Christianity. It wasn’t long before I became passionate about religion and had a whole new appreciation and respect for Christianity as well as for those who embrace Christianity — but only for the right reasons. Studying the faith as an outsider has given me what I believe to be a unique perspective in which I am certain both the atheist and theist will find enlightening. This isn’t the first time I have become obsessed with a topic. In 8th grade I became obsessed with martial arts and achieved my black belt in Kempo Karate four years later, then my second-degree black belt in Tae-Kwon-Do several years after that. In 2001 I became obsessed with public speaking, joined Toastmasters, and completed all 40 speeches for their prestigious Distinguished Toastmasters Award in a record six months. Electric cars, computer programming, podcasting — all topics in which I became obsessed, as well as a recognized leading expert. I should also mention that my adolescent obsession with making money resulted in me selling my company for $20 million at age 29. Financial freedom is what has allowed me the opportunity to obsess full-time on the topic of religion and Christianity this last year. Obsession, when properly directed, can be a great asset. So what’s my view on God and Christianity? Well that is what this whole book is about. In short, I do not accept the supernatural beliefs commonly associated with Christianity as being true. I studied and read the Bible with an open mind and an open heart. I prayed as suggested by my Christian friends to allow the “Holy Spirit to enlighten me” (just to make sure I was following all the rules). I carefully evaluated arguments for and against Christianity and the evidence (and lack of evidence) has led me to the conclusion that God certainly does exist, but not as being, but as a concept. While this idea may appear to invalidate all of religion, I will argue that religion, specifically Christianity, still has quite a bit to offer the human race. This is a subject about which I am extremely passionate, so while I might appear tough on some of the Christian beliefs, it needs to be made clear that it’s the belief I have a problem with and not the practicing Christian. This journey of mine began not by seeking God or Jesus, but by seeking truth. This does not mean I was searching for the “lack of Jesus” either. I was simply searching for a better understanding of the universe, my fellow humans, and the meaning of life. If truth led to God, so be it. If truth led to a world without God, so be it. I am fortunate enough to live a wonderful life with a loving family. I don’t have any spiritual voids that require filling and I do believe that if there is a God, he gave us everything we need to solve our own problems. My purpose for devoting this stage of my life to the study of God started out from personal curiosity alone and soon developed into a desire to share what I have found with others. My intent is not to harm Christianity in any way, but encourage more critical thinking using reason and logic. If I am “against” anything, it’s the ignorance of basing ones life on a set of beliefs that he or she cannot even begin to justify. It’s the accepting of ideas hammered into your head from childhood without critically examining those ideas with an adult mind. It’s the idea of being so committed to something being true, one loses all ability to reason and think logically. And I am not just referring to those who are religious. My goal for this book is to make you think about certain ideas harder than you ever did before. I want to make you question your own beliefs and think about how you came to hold those beliefs in the first place. I want you to challenge any of my ideas that do not make sense to you or ideas with which you disagree. Discuss these ideas with others, look up what others have to say on the Internet, evaluate the evidence and make your own decision based on your own careful evaluation. Let your beliefs become YOURS, whatever they may be. I have come to certain conclusions and I will certainly make them known. I hope to convince you through logic, reason, and appealing to your conscious, that adoption of the ideas I lay out in this book will lead to a positive “reformation” in traditional Christian thinking. What this means to you personally, and society in general, is described in detail throughout this book and summarized in the concluding chapters. 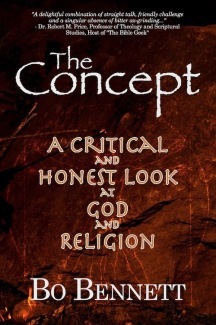 You might be saying to yourself, “Who do you think you are trying to change what God revealed?” As you will see throughout this book, Christianity is like one, big, 2,000-year-old game of telephone beginning with the actions and sayings of Jesus as interpreted by apostles, scribes, translators, popes, saints, and philosophers. I am simply going back to the very beginning (literally) and critically examining some of the more universally-accepted beliefs that we hold today. As you follow me on this journey, it’s my hope that you will see that the idea of divine revelation may just be a lot more human than divine.